Incongruously, at this moment, into the enclosed silence of the room came a sound from the road outside: voices in harmony, singing of the birth of Christ. There were eight of them including herself. They crowded rather sheepishly into the hall, shut the door quickly behind them, and stood waiting for they knew not what, full of polite murmurs and vague smiles. observations: Seasonal though this sounds, the carol singers are there for one cynical reason: to provide even more suspects in the murder of Cousin Emily – an unpleasant old lady, not much regretted. The book is very firm about being set at Christmas, but like various others, there is not much attempt at a festive atmosphere. In fact, it seems as though the author is rather casual about dates. The poor woman dies overnight Sunday/Monday. The investigation starts, then nothing seems to happen for several days – ‘Come and dine with me tomorrow evening. Both of you’ says the amateur helper, a solicitor, to the investigating policemen, and apparently there is no activity in the interim. By Thursday they manage to visit the dead woman’s bank – the manager appears entirely justified in his complaint that he should have been informed of the death earlier. When trouble comes, of this be sure:heaven has blessings still in store. So pretty much a classic English mystery of its date, 1958, and a good easy read – perfect for Christmas. Book and author are pretty much forgotten now, he's not even listed in most of the murder story reference books. For more Xmas entries, click on the label below. 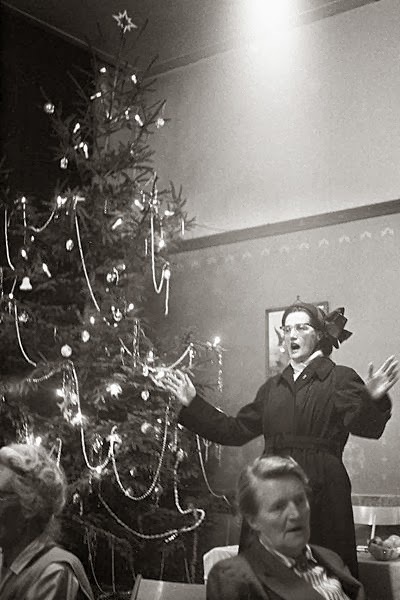 The picture, of one Alida Bosshardt leading the carol singing in the Netherlands, is from Wikimedia Commons. I like to keep track of possible Christmas mysteries, so thanks for covering this one. Although I have (vaguely) heard of Fox, you are right about him not being listed ... not easy to find anything about him. I don't think it will spoil my Christmas if I don't track this one down.